J and Rachel Hodge are fourth generation dairy farmers from Muskingum County, Ohio. Together with Rachel’s father, Lynn, they care for 200 registered Jerseys and farm 210 acres of crops and pasture at Windy Ridge Jerseys. The Hodge family prides themselves in the care they provide their cows year-round and their commitment to environmental stewardship. How is caring for your cows different in the winter compared to the summer? J: Chores take longer in the winter. We bed the freestalls and all the pens more often to keep the cows and heifers warm and dry. We’re always opening and shutting the curtains to block the wind and allow proper ventilation. We also use a powder teat dip in the winter which keeps their teats and udders soft, and still clean. Rachel: My job is to care for all of our calves. Calves get stressed anywhere under 50°F, so they all get calf jackets in the winter. I watch them more closely to make sure they don’t get sick, and that they all have fresh water available. J: We also have a calf warmer to help dry off and warm up newborn calves. It’s basically just a heater that goes in a warming box and blows them dry. It was a little expensive, but if it saves just one calf it’s worth it. What do you do with all your manure, especially in the winter? Lynn: We have a pit to store the manure in until the weather is right to spread it on the fields as natural fertilizer. We never spread manure on frozen ground and never on the whole hillside. We have contour strips and apply every other strip, so we don’t have any runoff. We have the manure analyzed so we know we know what minerals are in it – typically the main ones you look at are nitrogen, phosphorus and potassium. We’re able to know exactly what we’re putting on each field and how many gallons it needs. When I was a kid manure was treated as a pain in the neck, but now it’s a gold mine. 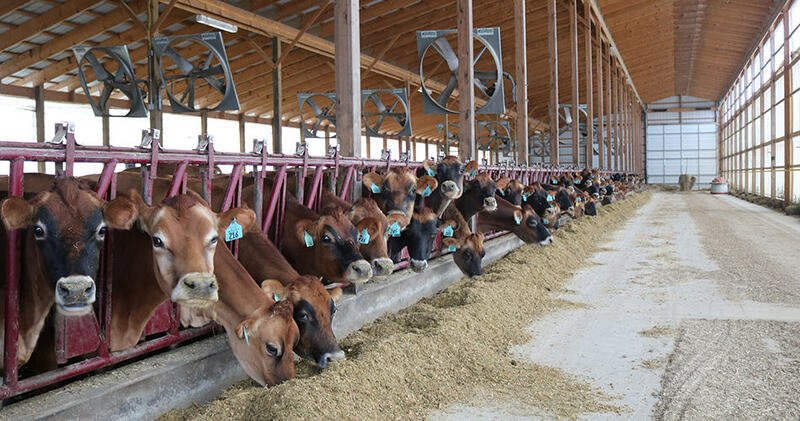 What’s something thing you wish everyone knew about dairy farming? Rachel: We truly love our cows and we want them to be happy and well. We completely believe in the product we make and know it’s safe. I know some people are concerned about the use of antibiotics, but as a veterinarian I can attest that we only use them if an animal needs it. J: Milk comes from an udder not a nut! (laughs) The biggest thing to me is that we truly love our cows and that our farming practices are meant to protect the environment, because if we didn’t we wouldn’t be in business.